A great 3000i Series 5.1 system comprising of 2 pairs 3010i, 3060 Subwoofer and Q 3090i Centre for massive cinema sound from all compact wall-mountable cabinets. Earn 745 loyalty points when you order this item. Special savings on this open box 3010 5.1 pack in walnut. The customer opened the boxes but decided to order black instead. 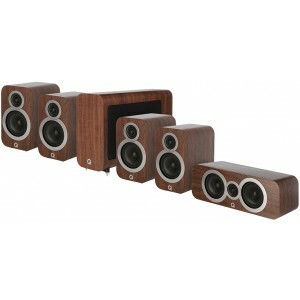 They are as new, boxed and complete with the Q Acoustics warranty. This 5.1 package combines 2 pairs of Q 3010i bookshelf speakers with the Q 3060 Subwoofer and Q 3090i Centre speaker to deliver a massive cinema sound from compact cabinets all of which can be wall mounted with optional, dedicated brackets.